Happy Friday folks! Memorial Day Weekend is finally upon us, and that means relaxation, sunshine, and hopefully a few well-deserved cocktails. While I’m still in New York, I plan to spend the weekend exploring the city more than I can when I’m here for fashion week. I will be checking out the newly launched 9/11 memorial and museum, exploring Williamsburg/Brooklyn for the very first time, and eating at some new restaurants with a few blogger buddies. 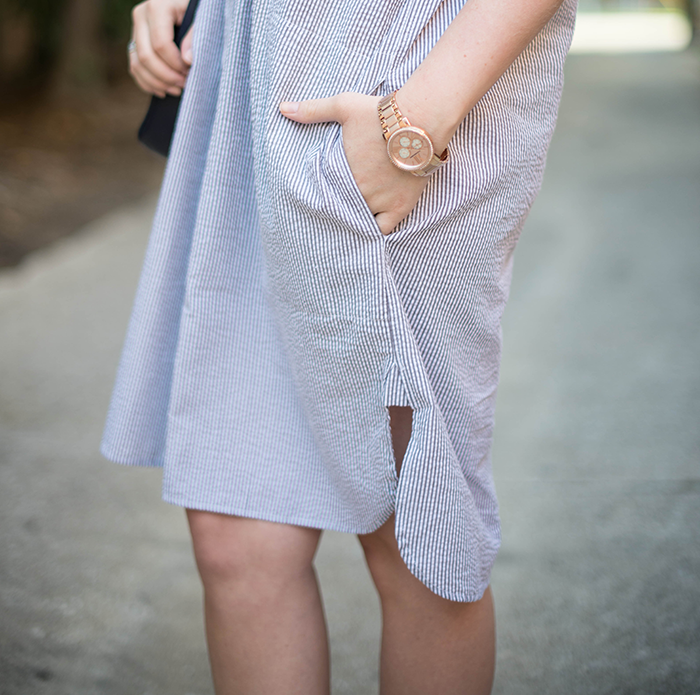 With all that walking around in mind, I plan to wear an easy, cool dress that keeps me comfortable all day. I found this cute seersucker dress (let’s face it, it might as well be a huge sack – it’s that comfortable) at By George South Congress a few months back. While I’ve dressed it down here, it looks super chic with a double band belt and wedges. I just love how simple it is! It’s perfect for a no-muss, no-fuss look when you have a busy day ahead where you need to be focused on comfort and nothing else. Something else I plan to do over the weekend is shop the many amazing Memorial Day weekend sales happening. There are literally so. many. sales! Check out the list of my favorite sales happening over the weekend and shop my outfit – hope you all have a safe and happy Memorial Day! Take an additional 20% off all sale items at Equipment! Stock up on you favorite silk shirts like this Brennan tunic and fun pieces like these pink + navy striped silk shorts. Enter code MDW20 at checkout! Moda Operandi’s spring sale launched last week and is even better this weekend! Get your favorite designer duds up to 50% off this weekend only. I can’t decide whether I want this pleated Ostwald Helgason skirt, or this tropical-print Stella Jean skirt. Both are so much fun, but the pleated one could work wonderfully for fall too! Which do you think I should get? PS, no code needed for this sale – click here to shop the spring sale! Enjoy an extra 25% off all sale merchandise at Rebecca Taylor this weekend! 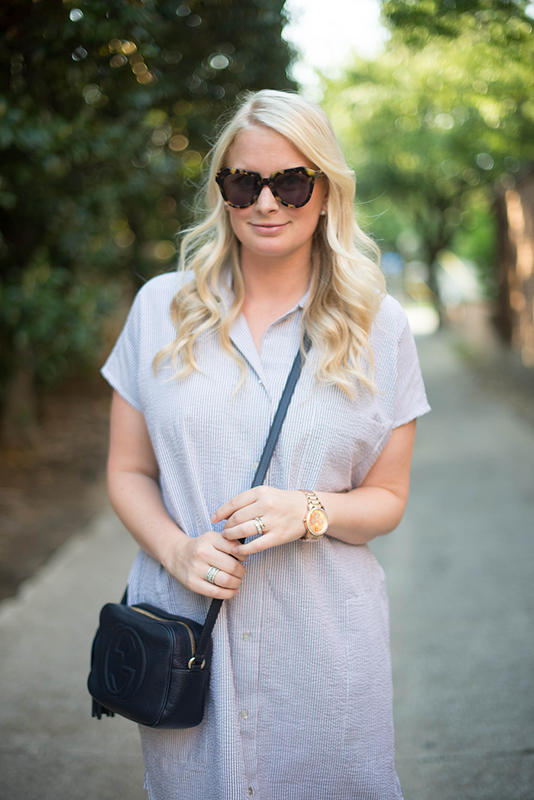 The crisp white shirtdress you’ve seen on me here and here is now only $177! Also totally obsessed with these tiger-print shorts. #Chic. Enter code SUMMERFUN25 at checkout. Joie is also offering an additional 20% discount on already marked-down merchandise! Save on chic pieces like this perfect-for-summer-soirees dress or this sunny yellow embroidered top with tassels. Enter code MDW20 at checkout! Being the travel junkie that I am, I’m constantly on the lookout for good luggage sales. It’s usually so freaking expensive, but a good piece of sturdy luggage is definitely an item you need to invest in when you travel as much as I do. Lucky for you (and me) Samsonite is having a Memorial Day Sale! They are offering 20% off any purchase over $100 on anything on their site. Whether you need a travel briefcase, giant rolling bag or the perfect carry-on, they’ve got you covered. I picked up a piece from the Silhouette Sphere Hardside collection just before fashion week and have been loving it. Just enter code MEMSAV20 at checkout to save big on your purchase! Happy memorial day! that dress looks so comfy, perfect for an off duty look. Nice relaxing look. Have a great weekend! Love those sunnies! Great laid back look…stripes on stripes is lovely. How did I not know MO was having a sale?! Off to go check it out now! Loving this easy look with the double print! Seersucker is so classic! I love to dress my boys in little seersucker blazers…too cute! Hope you have a great time in NYC. You should take a day trip out of the city…we have some of the best beaches here on Long Island! As tempting as the sales are, I’m going to take a raincheck from the mall and declutter/spring clean my closet this weekend. I hope you have a wonderful weekend in New York! I have loved all of your instagrams from the trip, looks like lots of fun! So many sales going on this weekend…to many options hah! I couldn’t agree more. 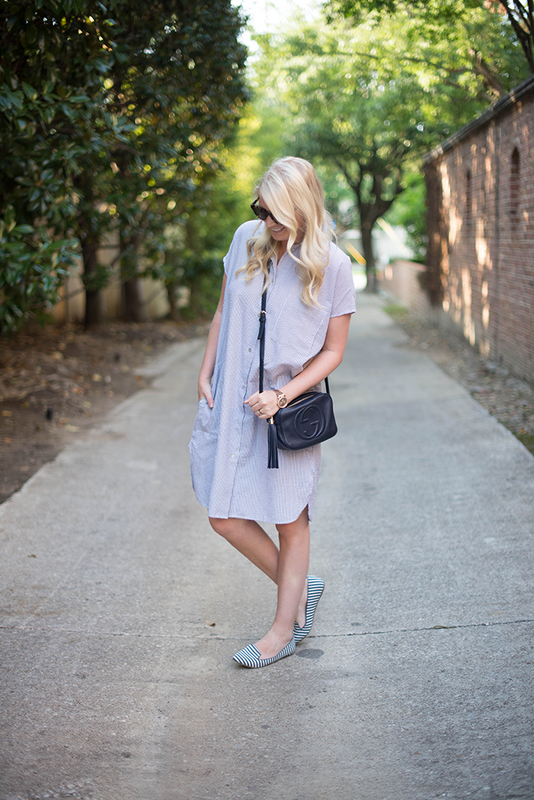 Every closet needs an easy, go-to dress, and this seersucker number is so perfect for summer.